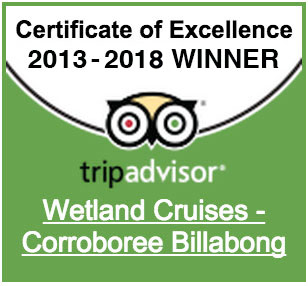 Corroboree Billabong is part of the Mary River Wetlands , home to the largest concentration of saltwater crocodiles in the world. Enjoy viewing plenty of crocodiles plus a huge variety of birds and other local wildlife in their natural environment. Our boat design allows you to get up close to the animals with plenty of opportunities to take amazing pictures as we cruise around this nature lovers paradise. It is not possible to make online bookings within 2 hours of any departure, if you wish to make a booking within this time you can only do so by calling reservations on (08) 89 855 855. (Open Daily 7 am - 5 pm). Our booking system is secure.